a poorly cured chunk of ham. In 1985, David Arroyo was struck by a meteor. He was minding his own business, watching Aliens for the twenty-seventh time on HBO. Since then he’s been writing verse shimmering with the power cosmic. He’s been published by Burning Word, Stirring, and Abyss & Apex. He is a graduate of the Stonecoast MFA program. 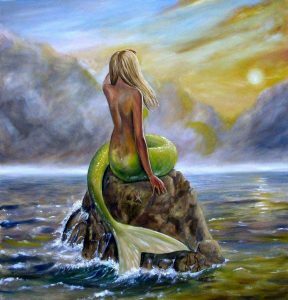 Editor’s Note: Pixabay’s Cassie Gorres provided the mermaid painting.